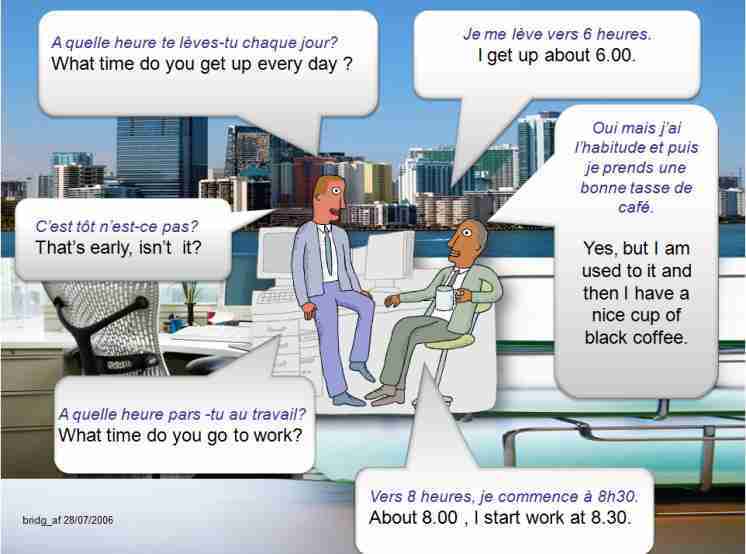 Learn English > English lessons and exercises > English test #6327: Dialogue : What time...? Replace the sentences of this dialogue in the right order. Click on an item. Then, choose UP or DOWN. I get up about 6.00 What time do you get up every day? About 8.00, I start work at 8.30. That's early, isn't it ? What time do you go to work? Yes but I'm used to it and then I've a nice cup of black coffee. End of the free exercise to learn English: Dialogue : What time...?